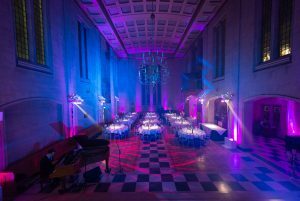 Find out why Austin Friars will be a fantastic setting for your next London event with Ultimate Experience, a member of the prestigious Concerto Group. This building was originally a monastic priory, dating all the way back to the 13th century, and features beautiful stained-glass windows and very high ceilings that give the impression of a much larger venue. Wow your guests, give them an experience they will remember for many years to come and show off your company’s latest achievements. Austin Friars is near the heart of the City of London, just a short stroll from Bank and Liverpool Street tube stations. With its proximity to some of the world’s biggest financial and legal firms, it is an ideal setting for corporate events, Christmas parties, exhibitions, award ceremonies and other private functions. So, if you’re planning a conference during a working day, or an after-work corporate dinner or party, then the location couldn’t be more convenient as a venue hire London. 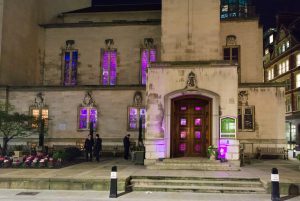 With a capacity of 50 to 220, Austin Friars is the perfect choice for small- to medium-sized events. Planning a corporate dinner with work colleagues and clients? Or an awards ceremony or exhibition of your latest works? Contact Ultimate Experience today and tell us what you need. Our award-winning partner Create is one of London’s most trusted corporate catering brands. 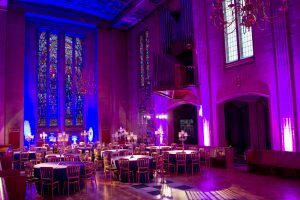 For nearly three decades, Create has been serving at dozens of prestigious venues across London and the rest of the country. This award-winning brand takes pride in its seasonal, imaginative cuisine, and is headed by Darren Deadman, a classically trained chef who has managed some of London’s biggest banqueting kitchens. Create also provides bespoke menus for every new occasion, which means all its food and drink will be specifically adapted to your event theme. So, whether you have a Mediterranean-style barbecue, a southeast-Asian-themed buffet, or a formal French dining theme in mind, you can look forward to an outstanding culinary experience. From world-class entertainment to outstanding production teams, at Austin Friars you’ll benefit from London’s best suppliers. Whether you’re planning a corporate function, a summer celebration, a Christmas party, or a fundraising event, Ultimate Experience will make sure it’s a huge success from start to finish.